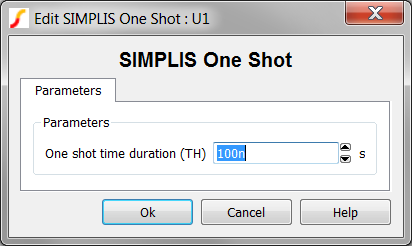 One shot output OUT with a high time equal to the parameter value TH. 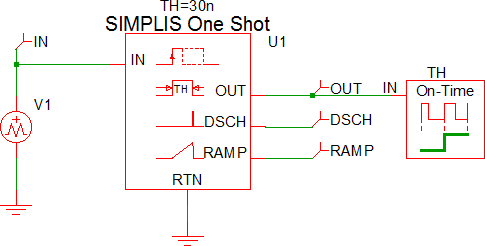 Ramp output on the RAMP pin with an amplitude of 0 to 1V. Discharge output DISCH pin which represents the time when the one-shot is resetting the ramp. The discharge time is 1% of the one-shot time duration. Multiple Selections: Multiple devices can be selected and edited simultaneously. This symbol was introduced with version 8.0; however, the model and supporting files are available in version 7.20 as well. In versions prior to 7.20, the schematic will simulate, but you will not be able to edit the parameters with the dialog pictured in this topic. Symbols placed on schematics in previous versions of SIMetrix/SIMPLIS can be automatically migrated to use the new symbols. The schematic tools menu Tools > Migrate Schematic Symbols to Version 8.20 will invoke a routine which migrates the existing symbols to the new symbols. As this action makes substantial changes to the schematic, it is recommended that you save a backup copy of the schematic first. Double click the symbol on the schematic to open the editing dialog. Change the One shot time duration..
One shot time duration (TH) s The high time duration for the one shot. The test circuit used to generate the waveform examples in the next section can be downloaded here: simplis_069_simplis_one_shot.sxsch. The first input pulse at t=10ns sets the one shot output high. At t=40ns, the one shot time interval expires and the DISC pin is high. Although the input pin is still high, the input is ignored because the one shot is edge driven. At a time of 60ns, another input pulse sets the one shot. An additional pulse at t=66ns is ignored. During the discharge portion, a pulse is input to the one shot to show that the one shot ignores this pulse. 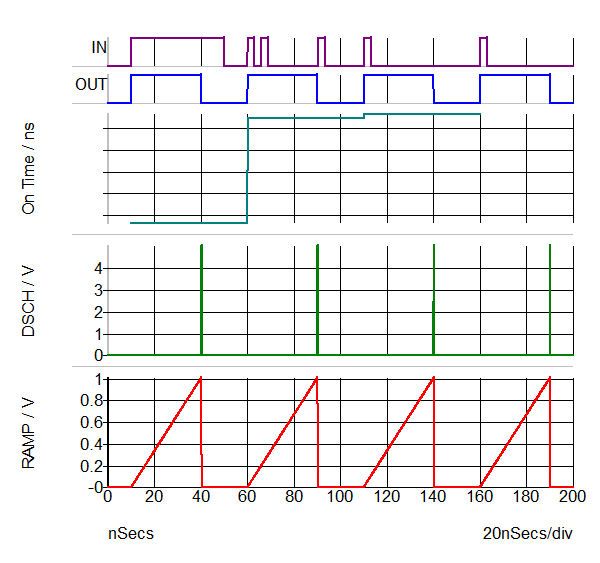 Two more normal pulses are input, one at t=110ns and a second at t=160ns. Note: The On Time of the one shot is plotted with a Per-Cycle Probe. The changing pulse width shown on the graph is due to numerical noise. The actual difference in on times is on the order of 1E-24 seconds.